Starring: Mary Elizabeth Winstead, Joel Edgerton, Ulrich Thomsen, Eric Christian Olsen, Adewale Akinnuoye-Agbaje, Paul Braunstein, Trond Espen Seim, Kim Bubbs, Jorgen Langhelle, Jan Gunnar Roise, Stig Henrik Hoff. 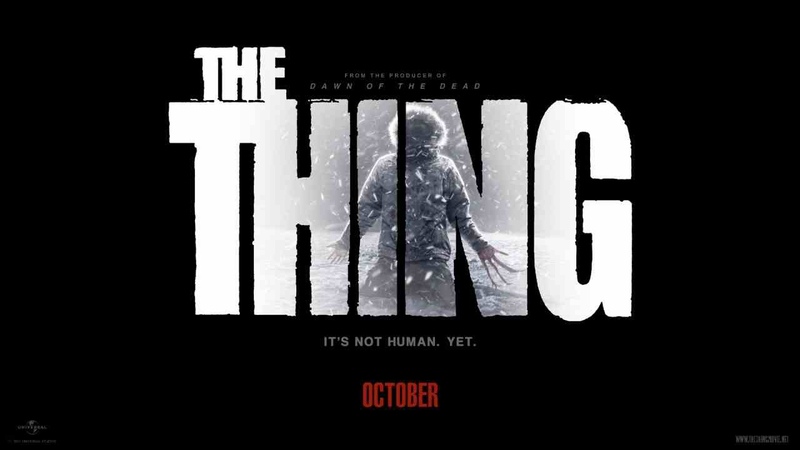 John Carpenter’s “The Thing“, released in 1982, is one of my all time favourite Sci-fi/Horror movies. It would have been lunacy to attempt a remake and thankfully, they haven’t. This is a prequel to the Carpenter classic and has similar ingredients. What it lacks though, is the level of terror that Carpenter could achieve. One of the intriguing parts of John Carpenter’s “The Thing” (which was a remake of the 1951 film “The Thing From Another World” and based on short-story “Who Goes There?” by John W. Campbell, Jr) was the mystery surrounding the origins of the alien organism. Set three days before the opening of it’s predecessor, this sheds light on what actually happened, and how the marooned Norwegian scientists met their fate before the arrival of MacReady (Kurt Russell) and the American team in the 1982 production. The setting is captured perfectly with the Antarctic outpost recreated, from Carpenter’s vision, with meticulous detail but the intrigue of Carpenter’s production is the main ingredient that’s lacking and the atmosphere isn’t nearly as threatening. However, it’s still a competently handled horror flick by first time director Matthijs van Heijningen Jr, who, like director’s Ridley Scott or James Cameron uses a female as the strong central character. This doesn’t compete on the same level as the aforementioned directors’ science-fiction work but by using a female character – instead of treading similar ground with a Kurt Russell type hero – it brings a new vision that give this film a feel of it’s own. Winstead delivers a believable performance, with a bit of testosterone back-up from the reliable Edgerton. Between them, an able cast of unknowns and good attention to detail, this just about achieves what it sets out to do. If you’re a fan of Carpenter’s film, then the chances are you’ll be interested in seeing this – if only, to get some backstory. If you don’t compare or expect too much, then you might just find that this works on it’s own terms. Nowhere near in the same class as Carpenter but it’s a decent attempt. This entry was posted on March 6, 2012 at 3:16 pm and is filed under Horror, Science Fiction with tags 2011. You can follow any responses to this entry through the RSS 2.0 feed. You can leave a response, or trackback from your own site. Nice review, Mark! I’ll be skipping this, though. Not my cup of tea. Just watched The Thing last week. Still to post a review of it. I liked it more than I thought I would. Reviews had been a bit negative when it was released, especially Mark Kermode. I thought it was pacey and kept me engaged even during the totally left field last act. Some excellent reviews on here. Thanks for the likes on my reviews. 25 done so far, still finding my way. As a massive fan of the original, i went into this expecting to dislike it but I can honestly say, it was rather good. It had the look down perfectly, which still allowed you to imagine Carpenter’s version to take of from. Keep posting my friend, I’m new to this also but I had amassed a lot of reviews on Flixster, which I copied and pasted onto my blog. It’s a slow process, but worth it. It’s more personal.